The 2003 NASCAR Winston Cup Series was the 55th season of professional stock car racing in the United States and the 32nd modern-era Cup Series season. The season began on February 8 at the Daytona International Speedway with the Budweiser Shootout and ended on November 16 at Homestead-Miami Speedway with the Ford 400. Matt Kenseth, driving the No.17 Ford for Roush Racing, was crowned the Winston Cup champion, despite winning only one race in the season. Chevrolet took home the NASCAR Manufacturers' Championship after capturing 19 wins and 264 points over second-place finisher Dodge, who had nine wins and 203 points. Ford finished the year third with seven wins and 200 points, and Pontiac finished fourth with one win and 125 points. This was the final year for Winston being the title sponsor of the Cup Series. Winston had been the title sponsor for NASCAR since 1971. After 33 years, Winston decided not to renew its sponsorship. NASCAR went to work to find a sponsor immediately, and on June 19, 2003, NASCAR announced that the telecommunications firm Nextel would be the new title sponsor of the Cup Series starting in 2004. This was also the final season for Unocal's 76 Brand as the official fuel for NASCAR. Unocal had been the official fuel since the sport's inception in 1948. Sunoco would replace Unocal 76 as the official fuel of NASCAR. This was also the last full time season for Pontiac. Pontiac had been with NASCAR on 2 different occasions. The first was from 1949 to 1964, then they returned in 1981 and continued full time until the end 2003, though a few teams ran Pontiacs on a limited basis in 2004, and they continued running in the Busch Series through 2005 and ARCA as late as 2007. In addition, NASCAR instituted a new points system after this season entitled the Chase for the Cup, in which after 26 races, all the points standings in the top ten as well as any position within 400 points of the lead, would be reset, so the drivers in those positions would be eligible for the championship. This was done primarily because of the huge lead Kenseth accumulated during 2003 despite winning one race. Ultra Motorsports 7 Jimmy Spencer 35 Tommy Baldwin Jr.
Robert Yates Racing 38 Elliott Sadler Raymond Fox Jr. The Budweiser Shootout was held February 8 at Daytona International Speedway. It was won by No. 8 of Dale Earnhardt, Jr.. The race featured drivers who have won a pole in the previous season or have won the event before. 2003 marked changes to the race's format, for the first time the race ran at night. The 70-lap event was now split into two segments. After the first 20-lap segment a 10-minute intermission took place allowing drivers to make pit stops and repair their cars. The second segment featured a 50-lap race to the finish with cars restarting double file on all restarts. Drivers were also required to make at least one pit stop under the green flag. 1 8 Dale Earnhardt, Jr. Chevrolet Dale Earnhardt, Inc.
Michael Waltrip became a two-time winner of the "Great American Race", even though the race was rain-shortened. Michael Waltrip scores his 3rd of 4 career wins. His first 3 career wins however, were all scored consecutively at Daytona under the NASCAR on FOX team (Feb. 2001, July 2002, and Feb. 2003), which included the support of FOX analyst and older brother Darrell. Casey Mears made his debut and finished in 27th. Ryan Newman had a crash in this race, in which his car got clipped by Ken Schrader coming off of turn 4 and slid down the front straightaway, flipping violently in the tri-oval and coming to a rest on its roof. This was the shortest Daytona 500 ever recorded. After they agreed to be the title sponsor for NASCAR's top series in 1971, this marked the 1,000th race for RJ Reynolds Tobacco Company and Winston. The Subway 400 was held on February 23 at North Carolina Speedway. Dave Blaney was the pole winner. Only win of the season for Dale Jarrett. This would also be Jarrett's last win until Talladega in October 2005, 2 years and 100 races later. The UAW-DaimlerChrysler 400 was held on March 2 at Las Vegas Motor Speedway. Bobby Labonte was the pole winner. Only win of the season for Matt Kenseth. His consistency throughout the rest of the year following this lone win would make him the Winston Cup Champion. The Bass Pro Shops MBNA 500 was held on March 9 at Atlanta Motor Speedway. Ryan Newman sat on the pole. After finishing in 4th place, Matt Kenseth took the points lead and never looked back. He led the standings for 33 consecutive weeks en route to his first and only championship. His 33 consecutive week point lead is a NASCAR record. The Carolina Dodge Dealers 400 was held on March 16 at Darlington Raceway. Elliott Sadler sat on the pole. This was the last time a Darlington race would be held on this date. Ricky Craven edged out Kurt Busch by .002 seconds, the closest finish in NASCAR history until the 2018 NASCAR Xfinity Series season opener at Daytona when Tyler Reddick edged out Elliott Sadler by 0.0004 seconds. This was the 5th, and as of 2018, the last time in Darlington's history that a race was decided by a last lap pass. Kurt Busch showed tremendous sportsmanship when he went to congratulate Ricky Craven in victory lane. This was the most exciting race of 2003 due to hard racing for the win. This race was the place where Larry McReynolds said one of his famed phrases that has been repeated many times in commercials and in media "They touch! They touch!". He shouted that to Craven's contact with Busch down the frontstretch on the last lap. This was Ricky Craven's final win. This was also the 154th and final win for Pontiac in NASCAR. 1st career pole for Elliott Sadler. The Food City 500 was held on March 23 at Bristol Motor Speedway. Ryan Newman was the pole winner for this race. NASCAR considered postponing the race due to the Start of the War in Iraq. The Government said to all professional sporting associations with their consent to go on. This was NASCAR's 2000th race run in Cup Series History. Kurt Busch finally wins a race in 2003 after finishing 2nd in 3 of the first 5 races of the season. This was the 6th race of 2003. Kyle Petty got caught up in a wreck where the force of gravity was over 80g. This would be the largest crash until 2010. The Samsung/Radio Shack 500 was held at Texas Motor Speedway on March 30, 2003. Texas native Bobby Labonte was the pole sitter for this race. The Aaron's 499 was held at Talladega Superspeedway on April 6, 2003. Jeremy Mayfield won the pole. Dale Earnhardt Jr. becomes the only driver in NASCAR history to win 4 consecutive races at Talladega, breaking him out of a tie with Buddy Baker. Dale Jr. would also become the 2nd driver in NASCAR history to win 4 straight superspeedway races at one track, joining Bill Elliott. Elliott won 4 Michigan races in a row when he pulled off season sweeps in 1985 and 1986. The "Big One" did not take long and collected 27 cars on the lap 4, making this the largest crash in a Cup race in the modern era. The crash barely included Earnhardt, Jr, who started in the back of the field and managed to race his way to victory lane anyway. 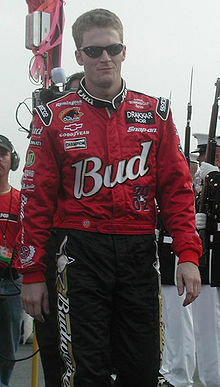 Earnhardt was involved in a controversial decision at the end of the race where it appeared he went below the yellow line in an attempt to improve position. NASCAR ruled Earnhardt was forced down making it a clean pass. The Virginia 500 was held at Martinsville Speedway on April 13, 2003. Jeff Gordon won the pole. The Auto Club 500 was held at California Speedway on April 27, 2003. Steve Park won the pole. This was Jerry Nadeau's last race. John Andretti's last career top 10. The Pontiac Excitement 400 was held at Richmond International Raceway on May 3, 2003. Terry Labonte won the pole. The race was shortened with only 7 laps to go, due to rain. Jerry Nadeau, driver of the No. 01 Pontiac for MB2/MBV Motorsports, was critically injured in a practice session for this race, and has not raced since. After this race, Jeff Green was fired for his remarks about Kevin Harvick and swapped rides with Steve Park in the 1 who was fired a day later than Green was. Steve would drive the 30 for the rest of the year while Green drove the 1 until Bristol. With Dale Earnhardt, Jr. finishing 3rd and collecting 5 bonus points, and Matt Kenseth finishing 7th with no bonus points, Kenseth lost 24 points to Dale Jr. in this race. Kenseth's point margin after Richmond was now only 20 points ahead of Earnhardt. This was the closest point margin all season for Matt Kenseth while he had the point lead. The Coca-Cola 600 was held at Lowe's Motor Speedway on May 25, 2003. Ryan Newman won the pole. The race was shortened to 276 laps due to inclement weather. With Kenseth finishing 2nd and collecting the 10 bonus points for leading the most laps, and Dale Earnhardt, Jr. finishing 41st with no bonus points, Kenseth gained 140 points on Dale Jr. in this race. Kenseth's point margin after Charlotte was now 160 points ahead of Earnhardt. This would make Kenseth's point lead safe and locked up for the rest of the season, as he would continue to have a 160+ point lead for the next 24 weeks, between this race and when he clinched the title at Rockingham in November, which is also a NASCAR record. This would be the only race of the season that Matt Kenseth would lead the most laps. The MBNA Armed Forces Family 400 was held at Dover International Speedway on June 1, 2003. Ryan Newman won the pole. Ryan Newman completed the last half of this race without power steering. Brett Bodine's last career start. The Pocono 500 was held at Pocono Raceway on June 8, 2003. Jimmie Johnson won the pole. This broke a 27-race winless streak for Stewart. This would be Tony Stewart's first win in a Chevrolet Monte Carlo. On Lap 7 Ken Schrader gets loose and hits the wall and flips once before catching fire. He was uninjured. With 3 laps to go, Jeff Green hits the inside wall on the backstretch and smashes the front of the car. This would lead to Tony Stewart winning the race under caution. Terry Labonte and Greg Biffle were also shown to have damage afterwards. The Sirius 400 was held at Michigan International Speedway on June 15, 2003. Bobby Labonte was the pole sitter. The Dodge/Save Mart 350 was held at Infineon Raceway on June 22, 2003. Boris Said was the pole sitter. Three days prior to this race, on Thursday June 19, NASCAR officially announced that the telecommunications firm Nextel would replace RJ Reynolds brand Winston as NASCAR's title sponsor for the Cup Series at the start of the 2004 season, thus ending a 33 year relationship between NASCAR and Winston, which began back on January 10, 1971. Controversy erupted on lap 71. Kevin Harvick was leading race winner Robby Gordon when a caution came out for a crash at a different part of the track. Gordon kept charging, and passed Harvick in the keyhole turn, taking the lead before they crossed the start/finish line. Harvick called it a "chicken move" and Jeff Gordon said "I could not believe it when I saw it" and called his passing under the yellow "unheard of." The controversial pass, however, was entirely legal under NASCAR rules at the time, and Robby Gordon was assessed no penalty. The so-called "unethical breach of racing ethics" proved to be the winning edge, and Robby Gordon went on to win the race. He was subjected to considerable scrutiny and ridicule after the race. However, others considered the complaints hypocrisy or "sour grapes" by the losers. The Pepsi 400 was held at Daytona International Speedway on July 5, 2003. Steve Park won the pole. This was Greg Biffle's first career Winston Cup victory. Greg Biffle would become the first rookie to score his first career win in a restrictor plate race (even though Davey Allison won his first career win at Talladega in 1987, there were no restrictor plates until the following year in 1988). This race marked the first time since 1993 that car number 43 did not race at Daytona, or did not race in a NASCAR points race since 1993. The Tropicana 400 was held at Chicagoland Speedway on July 13, 2003. Tony Stewart sat on the pole. The New England 300 was held at New Hampshire International Speedway on July 20, 2003. Matt Kenseth won the pole. The Pennsylvania 500 was held at Pocono Raceway on July 27, 2003. Ryan Newman won the pole. The Brickyard 400 was held at Indianapolis Motor Speedway on August 3, 2003. Kevin Harvick won the pole and the race. The Sirius at the Glen was held at Watkins Glen International Raceway on August 10, 2003. Jeff Gordon was the pole sitter. Paul Menard made his NASCAR debut, finishing 29th. This was Robby Gordon's final Cup win. The GFS Marketplace 400 was held at Michigan International Speedway on August 17, 2003. Bobby Labonte won the pole. Meanwhile, through the race, Todd Bodine bounces off Kurt Busch and then into Kenny Wallace, causing Bodine to get airborne and land on Wallace and erupt in flames. Fortunately both drivers escaped. An altercation occurred between Kurt Busch and Jimmy Spencer after the race and punches were thrown. A police report was filed and Jimmy Spencer was suspended for the next weeks race at Bristol. Kurt would be on probation after this race. The Sharpie 500 was held at Bristol Motor Speedway on August 23, 2003. Jeff Gordon sat on the pole. Fans disagreement over the suspension of Jimmy Spencer and only placing Kurt Busch on probation stemming from the incident the previous week prompted fans to boo Busch as he exited his car in victory lane. Busch's sponsor Sharpie was none too happy with the fan's response of their driver in victory lane as Sharpie was the sponsor of the race. Soon after, Sharpie began phasing themselves off of the #97 car. The Mountain Dew Southern 500 was held at Darlington Speedway on August 31, 2003. This would be the last time the race was held on this date (See notes below). Ryan Newman sat on the pole. This was the last Southern 500 to be held on its traditional Labor Day weekend date until 2015. This was Terry Labonte's first win in 157 races, dating all the way back to Texas Motor Speedway in March of 1999. This race would also be Labonte's final career Winston Cup win. This race has been labeled by millions of fans as the most popular win of 2003. As of 2018, Terry Labonte is the only driver in NASCAR history to score his first and last career win in the same race. He is also the only driver in NASCAR history to make his debut (finishing 4th in 1978), score his first career win, and score his last career win, all in the same race. The Chevy Rock and Roll 400 was held at Richmond International Raceway on September 6, 2003. Mike Skinner sat on the pole. With 8 laps to go, Kevin Harvick got loose against Ricky Rudd and spun in the wall. After the race, both cars stopped in the pit road and both drivers began a scuffle between the No. 21 and No. 29 with the pit crew member yells during the fight. Following an incident between Rudd and Harvick, Harvick fined $35,000 and crew chief Todd Berrier fined $10,000 for the incident. In addition, two other pit crew member fined $2,500 each and both pit crew members suspended for the next week's race. The Sylvania 300 was held at New Hampshire International Speedway on September 14, 2003. Ryan Newman sat on the pole. This was the final race for Bill France Jr. as the CEO of NASCAR. This was the final Cup race in which drivers raced back to the start-finish line as soon as a caution flag came out. Dale Jarrett's No. 88 Ford hit the wall exiting turn 4 and stopped in the middle of the track. Many cars entering the front straight swerved wildly trying to avoid Jarrett's car. The MBNA America 400 was held at Dover International Speedway on September 21, 2003. Qualifying was cancelled due to Hurricane Isabel; as a result, Matt Kenseth sat on the pole on owner points. This was the first Cup race for Brian France as the new CEO of NASCAR, having taken over the role from his father Bill France Jr., who stepped down on September 16 due to his ailing health. This was the first race in which the field was frozen at the start of a caution period. Racing back to the caution was no longer allowed; NASCAR uses video replay and scoring loop data to determine the running order at the moment of caution. In conjunction with the change, NASCAR introduced the free pass, or Lucky Dog, in which the highest-placed driver who is one or more laps behind the leader gets a lap back when the caution period begins. After finishing 9th, Matt Kenseth left Dover with a 436 point lead over Kevin Harvick, the largest point lead to be recorded for the 2003 season. This was the largest point lead for a driver to not clinch the championship in this points system since Richard Petty, and the points system's inception, in 1975. In that season, Petty left Charlotte, the 25th race of the 30 race season, with an 878 point lead, and with 5 races to go, the amount of points for him to win the championship was not enough, because in the Bob Latford points system, with 5 races to go, a driver would need a 925+ point lead between 1st and 2nd to clinch the title. The following weekend however, Petty left Richmond with an 827 point lead, and that was good enough for him to win the championship, because with 4 races to go, a driver would need a 740+ point lead between 1st and 2nd to clinch the title. This was also the largest point lead since 1994, when Dale Earnhardt won his 7th and final Winston Cup Championship by 444 points over Mark Martin. The EA Sports 500 was held September 28, 2003 at Talladega Superspeedway. Elliott Sadler won the pole. 1 15 Michael Waltrip Chevrolet Dale Earnhardt Inc.
2 8 Dale Earnhardt Jr. Chevrolet Dale Earnhardt Inc.
An early wreck took place on lap 10 when Jeremy Mayfield had a tire go down, during pit stops Dale Earnhardt, Jr. made contact with Jeff Green resulting in damage to his car's nose. Earnhardt Jr. would go a lap down on lap 62 after damage repair to his car. On lap 143 the 3rd caution came out when leader Jimmie Johnson was sent spinning down to the inside of Turn 1 after Dale Earnhardt Jr. bumped Michael Waltrip who slapped the side of Johnson, Johnson's car slid back up the Turn 1 banking barely missing a few cars. Dale Earnhardt Jr. was the lucky dog during the caution and got back on the lead lap. On lap 158 Johnson retired to the garage with engine problems. On lap 182 with 7 laps of racing left Elliott Sadler who was racing four wide near the front of the pack down the backstretch went to block Kurt Busch. Sadler made contact with Busch and was turned around, as the car spun it became airborne flipping through the air then landing on the roof near the entrance of Turn 3. The car continued to slide across the grass to the track pavement in Turn 3, when the car caught the pavement it tumbled 5 more times before coming to a stop. Elliott Sadler was removed from the car and was ok. The race was red flagged as track workers cleaned up debris. Michael Waltrip led during the restart with 5 laps to go, Waltrip led all of the last five laps with drafting help from teammate Dale Earnhardt Jr., as the checkered flag waved cars were running 5 wide mid pack when Bill Elliott made contact with Bobby Labonte creating a small wreck in Turn 1. Waltrip celebrated the win by popping out of his car's newly installed emergency roof hatch after doing donuts on the infield grass. Michael Waltrip's last career victory. This would be Michael Waltrip's only win outside of Daytona, only win not to be broadcast on FOX, and only win without the support of his older brother and FOX analyst Darrell in the booth. Dale Earnhardt Jr. would come up one spot short on his quest to win 5 straight Talladega races. He would also fail to break out of a tie with Bill Elliott by trying to win 5 straight superspeedway races at one track. Matt Kenseth experienced his first DNF of the 2003 season when he blew an engine with 30 laps to go. He finished the race in 33rd position. With that DNF, Kenseth's 436 point lead dropped to a 354 point lead. This would be the last race of the season for Matt Kenseth to collect 5 bonus points for leading a lap. The Banquet 400 was held at Kansas Speedway on October 5, 2003. Dale Earnhardt, Jr. sat on the pole. This was Ryan Newman's 8th and final win of the season. He scored the most wins of 2003. This was the 2nd consecutive week of problems for Matt Kenseth. After blowing an engine at Talladega and finishing 33rd the previous week, he was involved in a crash on lap 69 with Michael Waltrip. He still managed to finish the race, but he finished in 36th place, 47 laps behind race winner Ryan Newman. With 2 straight weeks of disappointment, Matt Kenseth lost 177 points, going from a 436 point lead, to a 259 point lead. The UAW-GM Quality 500 was held at Lowe's Motor Speedway on October 11, 2003. Ryan Newman sat on the pole. This was the first fall race at Charlotte to be held on a Saturday night. Brian Vickers made his NASCAR debut, finishing in 33rd. The Subway 500 was held at Martinsville Speedway on October 19, 2003. Jeff Gordon sat on the pole. Jeff Gordon led the race's majority, having led 313 of the race's 500 laps on his way to victory. Gordon also swept both Martinsville races for the 2003 season. Along with his 313 laps led, he led the final 206 laps. The Bass Pro Shops MBNA 500 was held at Atlanta Motor Speedway on October 26 – October 27, 2003. Ryan Newman sat on the pole. Jeff Gordon would be the only driver of 2003 to win back-to-back races. This win also marked the 18th time in his career that Jeff Gordon has won back-to-back races. The race was suspended after 39 laps due to rain and resumed the following day. A crash involving Ryan Newman and Dale Earnhardt Jr. with 4 laps left caused the race to finish under caution. The Checker Auto Parts 500 was held Phoenix International Raceway on November 2, 2003. Ryan Newman sat on the pole. The Pop Secret Microwave Popcorn 400 was held at North Carolina Speedway on November 9, 2003. Ryan Newman sat on the pole. This was Bill Elliott's final win. This was the final Rockingham race in the fall. Matt Kenseth clinched the Championship by finishing in 4th place. In the Bob Latford points system, Kenseth needed a 185+ point lead to clinch the title with one race to go, and he did so by being 226 points ahead of Jimmie Johnson after the race. Ironically though, back at Atlanta in March, Kenseth finished 4th in that race to claim the lead in the Championship standings and never looked back. Then, in this race, he finishes 4th to clinch the Championship. Kenseth won the title by winning just one race, that being back at Las Vegas in March. His consistency throughout the rest of the year following the win led him to be the Winston Cup Champion, scoring 11 top 5s and 25 top 10s. He became only the 4th driver in NASCAR history to win a championship by winning one race. The other 3 were Bill Rexford in 1950, Ned Jarrett in 1961, and Benny Parsons in 1973. Future teammate Carl Edwards almost did it in 2011 (complete with winning the same race Kenseth did), but a vastly different points system and a late charge by Tony Stewart saw Stewart win via tiebreaker (five wins, all in the Chase, to Carl's one at Vegas). Kenseth held a 160+ point lead for 24 consecutive weeks, from Charlotte back in May, to clinching the title at Rockingham in November, a NASCAR record. The following weekend at Homestead however, Kenseth would finish in 43rd/last place, and Johnson would finish 3rd, and Kenseth would officially finish his championship season by 90 points over Johnson. This was Matt Kenseth's 31st race of 2003 where he finished on the lead lap. 31 lead lap finishes in a season is a NASCAR record. The finish of this race also holds a bit of irony for both Bill Elliott and Matt Kenseth. In September of 1998, Bill Elliott attended the funeral of his father, and it was Matt Kenseth that filled in for Elliott at Dover International Speedway that year, and with that, Matt made his Winston Cup debut, and he finished in the 6th position (3rd highest debut finish in NASCAR history, behind Terry Labonte, who finished 4th at Darlington in 1978, and Rusty Wallace, who finished 2nd at Atlanta in 1980). Ironically, 5 years later, Bill Elliott went on to score his final career win, and Matt Kenseth went on to score his only championship. Matt Kenseth became the 5th different NASCAR Winston Cup Champion in the last 5 years. 2003 marked 5 out of the last 6 seasons that a driver would clinch the NASCAR Winston Cup Championship with one race to go (Jeff Gordon in 1998 and 2001, Dale Jarrett in 1999, Bobby Labonte in 2000, Matt Kenseth in 2003). The 2003 NASCAR Winston Cup Season would be the final season ever that a NASCAR driver could clinch the championship title before the final race of the season. The Ford 400, the final race of the season, and the last race ever under the "Winston Cup" name, was held at Homestead-Miami Speedway on November 16, 2003. Jamie McMurray sat on the pole. First race with new configuration at Miami. Bill Elliott dominated this race by leading 189 of 267 laps, but while leading on the final lap, Elliott cut a tire between turns 1 and 2, handing the win to Bobby Labonte. Labonte only led one lap, which would be the last lap. Elliott would end up with an 8th place finish. Matt Kenseth, who had clinched the Winston Cup Championship at Rockingham one week earlier, finished 43rd due to a blown engine on lap 28, his worst finish of the season. This would be his 2nd DNF of 2003, along with Talladega back in September, and that was also due to a blown engine. Even though he clinched the title at Rockingham with a 226 point lead over Jimmie Johnson, Johnson finished 3rd and collected 5 bonus points, and Kenseth finished 43rd with no bonus points. Those results made Kenseth lose 136 points to Johnson in this race, and Kenseth officially won the title by just 90 points. The last time Kenseth had the point margin under 100 points was back in May after Richmond, when he was ahead of Dale Earnhardt, Jr. by only 20 points. Also, after having the largest point margin of the season back in September at Dover with a 436 point lead, Kenseth lost a total of 346 points to 2nd place in the final 8 races. Kenseth won $4,250,000 from Winston and RJ Reynolds Tobacco Company, the most amount of money for a winning champion in Winston's history. Kenseth broke 3 records during the 2003 season. The first record was when he led the championship standings since early March after Atlanta, and he would lead the points for 33 consecutive weeks. The second record was when he held a 160+ point lead for 24 consecutive weeks, from Charlotte back in May, to clinching the title at Rockingham in November, even though he would officially finish the season by 90 points ahead of Johnson. Finally, the third record was when he would finish on the lead lap in 31 of 36 races. Kenseth would finish his championship season with 1 win, 11 top 5s, 25 top 10s, 31 lead lap finishes, and only 2 DNFs. Jimmie Johnson won the tight fight for 2nd place in the points standings over Dale Earnhardt, Jr., Jeff Gordon, Kevin Harvick, and Ryan Newman. With that 2nd place finish in points, he won over 1.7 million dollars. This would be the 2nd straight season that a driver who won the most races would finish outside of the top 5 in points (Matt Kenseth won 5 races in 2002, but finished 8th, and Ryan Newman would win 8 races in 2003, but finished 6th). Tony Stewart clinched 7th place in points right when the race started. He could not gain enough points to be in 6th, and he could not lose enough points to fall back in 8th. Bobby Labonte finishes 8th in points. Last career top 10 points finish for Labonte. Bill Elliott finishes 9th in points. This is the first time that he would finish in the top 10 in points since 1997, when he finished in 8th that year. Last career top 10 points finish for Elliott. Terry Labonte finishes 10th in points. This is the first time that he would finish in the top 10 in points since 1998, when he finished in 9th that year. Terry came into this race 56 points behind Kurt Busch for 10th spot. However, Kurt Busch crashed with Kevin Harvick and Ryan Newman on lap 4, and he would finish 36th. Terry finished 15th and collected 5 bonus points, and he would gain 68 points on Busch due to his crash, and with that points gain, Terry would take 10th place from Kurt by 12 points. With that 10th place points finish, he was able to get the final spot on the stage for the last Winston Cup Awards Banquet. Last career top 10 points finish for Labonte. This was the last career win for Bobby Labonte. This would also be 2 races in a row where 2 drivers last wins happened (Bill Elliott was the week before). Last career full time season for Bill Elliott. This was the first time since 1998 that both Terry and Bobby Labonte would finish in the top 10 in points together. This would also be the final season in their separate careers that they would both finish in the top 10 in points respectively. Rusty Wallace failed to finish in the top 10 in points for the first time since 1992. He finished the season in 14th. This marked the final race for Winston as NASCAR's title sponsor for the Cup Series after 33 seasons (1,035 races). This marked the final race for Unocal 76. It had been the official fuel of NASCAR since the sport's inception in 1948 (all 2,030 races). This marked the final full time race for Pontiac. Johnny Benson was the highest finishing Pontiac driver in this race by finishing 4th, giving Pontiac its final top 5 finish ever in the series. Pontiac competed in NASCAR from 1949 to 1964, and then came back full time from 1981 to 2003. Carl Long, Andy Belmont, and Hermie Sadler however, did run a combined 4 races (which all 4 races were consecutive) in a Pontiac at the beginning of 2004, driving the number 02 car for Sadler Brothers Racing, a single car team. Carl Long raced the car at Las Vegas in March, then the next 2 weekends, Andy Belmont raced at Atlanta and Darlington, and finally, one week later, Hermie Sadler raced at Bristol in April. The Bristol race marked the final race ever for Pontiac, and those 4 races would be the final 4 races for Pontiac in NASCAR. Andy Belmont attempted Rockingham in February and Texas in April, but failed to make both races. Texas was the last race ever attempted for Pontiac. After Andy Belmont failed to make the Texas race, Pontiac left NASCAR for good. Pontiac would leave the sport full time with 3 Manufacturer's Championships (1961, 1962, and 1993), and scoring 154 Career NASCAR Winston Cup Series wins. Rusty Wallace is the all time winner in a Pontiac at 31. Only 4 drivers have won the Winston Cup Series Championship driving a Pontiac: Joe Weatherly (twice in 1962 and 1963), Rusty Wallace (1989), Bobby Labonte (2000), and Tony Stewart (2002). The easy favorite for Rookie of the Year heading was Jamie McMurray, who had won the previous year in just his second start, and he did not disappoint, posting thirteen top-tens and a pole position despite not winning again. Runner-up Greg Biffle finished in the top-25 in the first two races, failed to qualify at Las Vegas, then won the Pepsi 400, while Tony Raines posted just one top ten finish in BACE Motorsports' only full season in Winston Cup. Casey Mears could not finish higher than 15th in his debut season, but has gone on since to garner sixteen top-tens. Former Craftsman Truck Series champion Jack Sprague only lasted eighteen races before being released from his No. 0 ride, while Larry Foyt's best finish in 20 starts was a sixteenth at the season ending race at Homestead. The only other declared candidate, Hideo Fukuyama, dropped out early due to a lack of funding from his BelCar Racing team. ^ "Standings: 2003 Manufacturer Standings". NASCAR; Turner Sports and Entertainment Digital Network. Retrieved September 12, 2009. ^ NewYorkTimes.com: Waltrip Ends Streak of Earnhardt Jr.